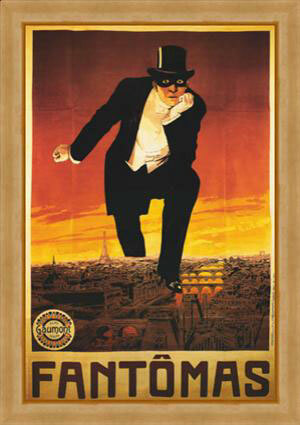 This early French feature kicked off a series of popular “Fantômas” crime films. Here, the cunning criminal steals from and murders members of the nobility in a posh hotel, escaping despite all security precautions and leaving a mysterious calling card. He is pursued by the brilliant Inspector Juve of the Surete, but manages to stay one step ahead of him through his exploits. Unlike American thrillers of the time, the filmmakers increase the suspense by not giving away the identity of the criminal right off. Once it does happen, though, the action shifts to his daring plan to escape from police captivity and a death sentence. Fantômas appears to me to be a kind of anti-hero, someone the audiences rooted for in spite of themselves, because he was so subtle and sly, and ultimately charming, even though he put hurt innocent people for his own selfish ends. The DVD from Kino includes a powerful orchestral score, which at times threatens to drown out the silent action on the screen, but does add to the watchability, in general. The director, Louis Feuillade, made hundreds of films in the 1900s and teens (including “Les Vampires” and “Judex“), many of which are blessed with considerable cinematic vision.